You may have noticed some shiny new buttons around the website. Try them out! 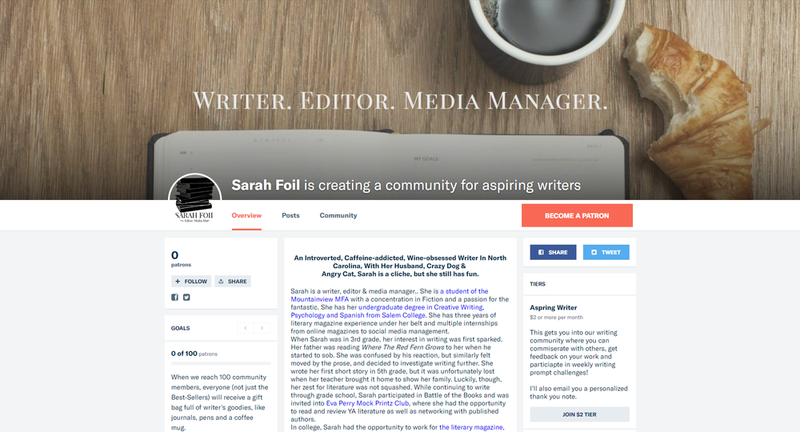 They'll bring you to my Patreon page, where I'm creating a new community for aspiring writers. You can contribute as little as $2 per month or as much as you want. The more you contribute, the more you'll get back, including half off editing services, one-on-one writing coaching, gift bags and more. If I thought it was pouring rain last week, this week it's monsooning. My phone has been buzzing everyday warning me about severe storms and flash floods. That's been a bit obnoxious and the constantly gloomy weather has made being productive hard. I've been in talks with a few different writers this week about upcoming author interviews. Get ready for interviews from a lot of independent authors of all genres, including Fantasy and Queer literature as well. Our TV Show this week has been the Netflix Original series, BoJack Horseman. To be honest, this is probably my third time watching the show through. When I first heard about it, it sounded ridiculous and more than a little bit immature. I could not be more wrong! This is one of the few shows that can make me laugh and cry all in one episode. We finished up Camp NaNoWriMo this week! I was able to finish up a few days early and finished this last draft of my novel. I've spent the rest of the week getting the draft polished and cleaned up before I send it on to Beta-Readers this weekend. Can't wait!